Fox News Channel is facing another potential ad boycott, this time sparked by a top newspaper editor who called it “the most effective thing” Americans can do to rein in the cable network’s hate-mongering coverage. 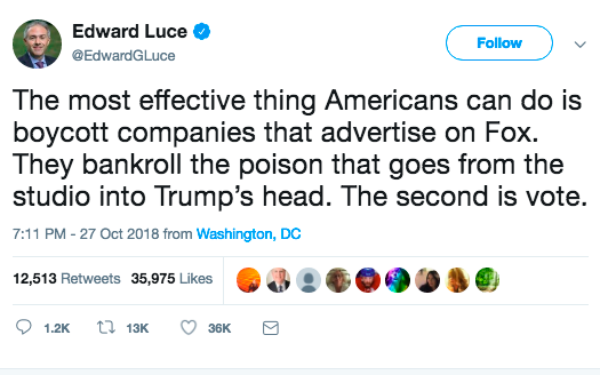 "Boycott companies that advertise on Fox," Financial Times U.S. national editor Edward Luce tweeted Saturday in response to the network’s incessant coverage of the Latin American "caravan," which some believe sparked the massacre at the Tree of Life synagogue in Pittsburgh. "They bankroll the poison that goes from the studio into Trump’s head," Luce continued. Left-wing media watchdog Media Matters also weighed in with yet another call on advertisers to pull out of Fox News Channel. "We urge Expedia, McDonald's and Capital One, as well as other major Fox News advertisers, to talk to their media buyers, listen to their customers, and consider suspending their relationship with Fox News until the network makes meaningful changes to curb its propagandistic narratives that intentionally spread disinformation and incentivize violence," Media Matters President Angelo Carusone said in a statement released Monday night, including a link to a list of current Fox News advertisers. Editor's Note: This article has been updated from a previous version. 5 comments about "Editor Calls For Boycott On Fox News Advertisers Who 'Bankroll The Poison'". Henry Blaufox from Dragon360, October 30, 2018 at 11:17 a.m.
Is it prudent for an executive at one global news media company to publicly call for such action against a competing firm? Talk about glass houses. Many of us have colleagues and friends at both organizations. Rick Furr from Bullseye Interactive Group, October 30, 2018 at 11:54 a.m.
Last time I checked, it was the Liberal News Networks in tears the night President Trump won the election. I didn't see any tears for Mitt Romney or John McCain when they lost the Presidential race. What a joke to tell companies to boycott Fox News, a news organization leading cable companies in ratings, I guess ratings don't mean anything to advertisers. If CNN, MSNBC, ABC (Disney), NBC (Comcast), CBS did their job in promoting the news without such a liberal viewpoint, maybe they can compete with Fox News in the ratings battle. Joe Mandese from MediaPost, October 30, 2018 at 12:14 p.m.
@Henry Blaufox: Probably not prudent, and I don't think he was speaking on behalf of Financial Times. All the more reason why I think it is interesting -- and brave of him -- to speak out. Journalists are like other people on social media. Unless they are expressing themselves via their employeers Twitter account, they are expressing themselves. @Rick Furr: I don't think the story is about politics. It's Fox News inciting people. Ed Papazian from Media Dynamics Inc, October 30, 2018 at 12:40 p.m. I tend to agree that asking advertisers to boycott news and other media that one disagrees with on editorial matters is not a democratic approach---why not appeals for counter boycotts of "The New York Times", MSNBC or "The Washignton Post" by conservatives for exactly the same reason? As an independent, who, very frankly, can't stand either the extreme Right or the Left, I regard this kind of economic pressure as hypocritical. If you don't like a medium, in this case, because of its political slant, don't attend, read or watch it, instead of trying to destroy its profit-making base by asking---or demanding--that advertisers deny it ad dollars as "punishment". Tom Siebert from BENEVOLENT PROPAGANDA, November 1, 2018 at 10:08 a.m. The FT lost all credibility when they plastered that ridiculous front page story about Gareth Williams, the MI6 spy, "committing suicide" by somehow zipping himself up inside a locked travel bag and drowning himself in a bathtub. If Luce is talking like this you can bet some intelligence puppeteer is pulling his strings.